Because of my Southern heritage and my chosen time period of historical interest...and also because of my lifelong study of Daniel Boone and his contemporaries... I build only Southern style guns. I use what I call my Boone Gun as a base to work from. "Rifled or smooth...they are both guns..."
Boone also said he "hated pretense and luxury". Being raised Quaker was a goodly part of and foundation for that attitude and is something I try to reflect in the Boone guns. "I prefer to leave the very admirable "high art" side of traditional gunmaking to my contemporary gunmaking friends who hunger and strive for that in their work. My desire is to make common sense, believable, period correct guns of very high quality with great lines, superb balance and simple beauty... guns that can be used without worry...perfect for hunters, trekkers and reenactors". My basic style is English and reflects good workmanship by an experienced frontier blacksmith/gunsmith somewhere in the Middle Ground; not too near the outward border, but well away from any towns in the East. 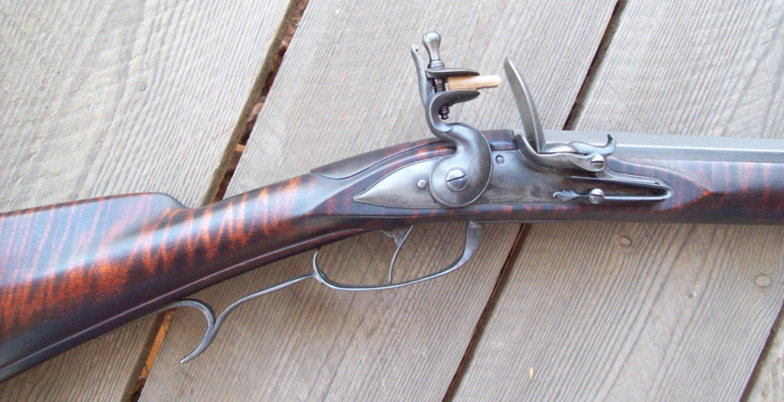 Variations found in original guns are many. The words "correct and incorrect" are, in my opinion, difficult to use in good conscience, especially in the South, because there were many "parts guns" along the frontier. Usable locks, barrels, triggers, mounts, ect., were never wasted or discarded because they might be considered "out of school". Lastly, there is , and was, a world of difference between a poor man and those of wealth and position. A genuinely poor man was lucky to have a gun at all. A "common man" (a man in between, like most folks today) is where my Boone gun falls. To say "Boone gun" is the same as saying "common gun". What follows is my interpretation of a common gun on the early Southern frontier that reflects the remedy for two important jobs that had to be done..."provide food & provide protection". Don is not currently accepting orders for "custom" rifles. Check the web site often under "Guns For Sale" for "spec" rifles and fowlers.